… but says nothing about how to resolve those conflicts. Many NoSQL DB choose vector clock to control the ordering of multi-version records. Q: Why we can’t use machines’ timestamp to version changes in distributed system? A: Using the physical timestamp of a record is no good because you can’t guarantee that time will move forward in a uniform manner across all nodes in the cluster. It means a ‘later’ record might have an earlier timestamp than some record produced before it. Q: What is Lamport Clock? A: Lamport Clock can be considered as a logical timestamp. 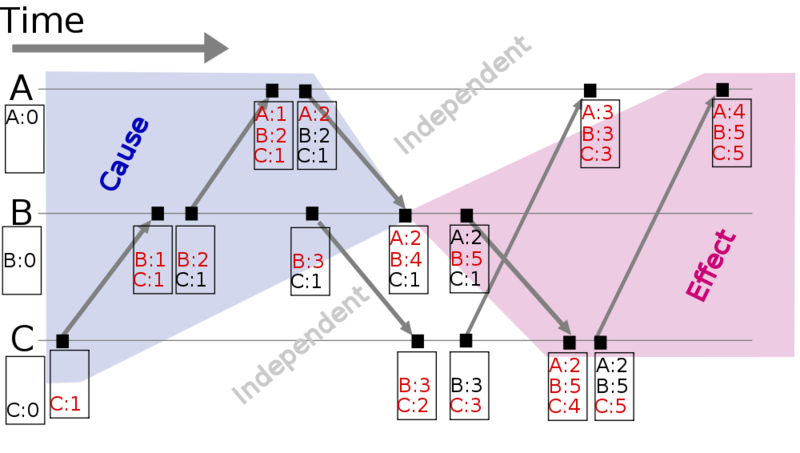 A Lamport Clock is a single integer value that is passed around the cluster with every message sent between nodes. Each node keeps a record of what it thinks the latest (i.e. highest) Lamport Clock value is, and if it hears a larger value from some other node, it updates its own value. Q: What are the difference in between of Lamport Clock and Vector Clock? Q: Problems with vector clocks? Cassandra breaks a row up into columns that can be updated independently.